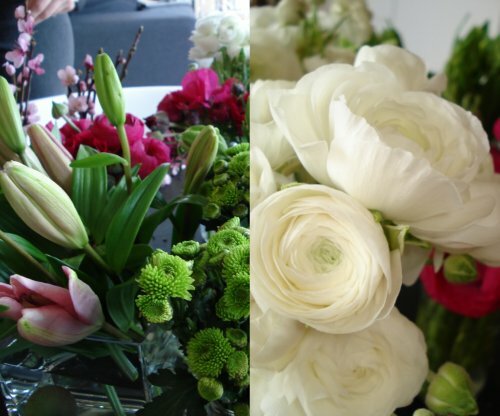 i do love to throw a party and for me, it all starts with the flowers. it's hard to go past pinks for a little girl's first birthday party, but i wanted it to be 'little girl modern' and not too 'wishy-washy pretty', so i went for a selection of pinks, (soft & bright), whites and greens. to my delight, the markets even had a bunch of gumnuts, or 'honky nuts' as kingsley calls them.. apparently it's a western australian thing. just who's calling who honky here?! sitting at my desk even now, four days later, the little jars of flowers everywhere still look & smell gorgeous. i think it's mainly the freesias i can smell. heady.